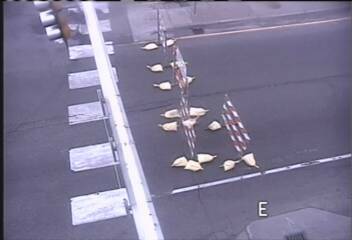 Cones and barriers went up Monday morning on University Avenue in northeast Minneapolis and Columbia Heights as a road resurfacing project got underway. The closure is between Lowry Avenue NE. and 44th Avenue and will be in place for about two months, the Minnesota Department of Transportation said. For cars and light-duty vehicles, the detour is via Central Avenue. For semitrailer trucks, the detour is via East River Road and Interstate 694. Crews will be removing the top layers of the highway and will be replacing it with asphalt. It is expected to provide an additional 30 years of life to that stretch of University Avenue, MnDOT said.